The all seeing eye with its burning gaze rests atop its twisted throne. This spire draws its powers from the evil parts of the Rift where many do not dare to tread. Some believe it is where the souls of the dead rest. The rift crystal orbs act as a gateway providing some strange creature the ability to glimpse through them and allow it to reach out from wherever it resides with its fantastic powers. 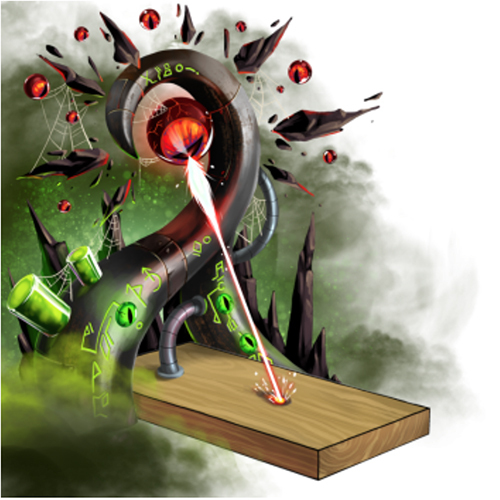 The All Seeing Eye Skin can be used on the Focused Crystal Laser trap. The trap's stats (power, power bonus, attraction bonus, etc.) are not changed. The All Seeing Eye Skin may be made available during the annual Halloween event and can be traded on the Marketplace or through Give To Friends. 14 October 2014: The All Seeing Eye Skin was introduced as part of the Halloween 2014 event.. This page was last edited on 9 December 2017, at 09:05.